Whether you’re a paintballing beginner or veteran, there are always ways to improve your game and further the experience. Paintball strategies have evolved over the years and here we look to give you the top 10 paintballing tips for success, sourced by marshals, experts and some of the UK’s top paintballers. We love paintball and you should too. Always play safe, by following the instructions given to you on the day and respecting your fellow competitors. But without further ado, let’s take a look at 10 of the best paintballing tips you can bring to your game. In paintball you’ll have a range of scenarios and locations depending on the game type you’re playing. These can be small, quick-fire, five-minute games or larger areas where stealth and patience could be key to success. On the larger sets it’s important to be fully aware of your surroundings and second-guess where your opponents could be hiding out. You shouldn’t get too caught up focusing all your attention on one area you believe an enemy to be lurking, as this could easily be a distraction whilst his team sneaks up to flank and eliminate you from the game. Continually be on the lookout and ensure you’re not the next player to be walking off with paint splattered over their back. If you stay in the same spot for too long, no matter the defensive cubbyhole you believe you’ve found, your plan will eventually be foiled. At some point or another your opponents will arrive on both sides and if you’ve been picking them off for the last 10 minutes at the same tree, prepare to be pelted with paintballs. Our best advice? Stay on the move and keep looking for new areas to take aim at your opponents. Also remember this is a team game. You’re no use to anyone if you hang around the starting zone. Don’t be afraid to dash forward in an attempt to take new ground and help your team move forward. See a few enemies hiding behind the same cover and can’t seem to get anywhere near them? Our best strategy is to get them ducking whilst making your move. Paintballs make a hell of a noise when smashing against wooden barricades and trees; enough to dissuade opponents from stick their heads out. So, place a couple of well aimed bullets in close proximity to your opponents and then charge forward to a new, better location when their heads are down. You can even work closely with your squad when doing this, as one fires at your enemies whilst the other runs for new cover. You’ve only limited ammo each round and don’t want to be firing away your bullets needlessly. For that reason it’s good to employ the strategy of stealth on occasions. If you’ve found a great hiding place, then don’t alert your enemies instantly. Wait a few minutes to see if there’s any activity nearby and you could well take out a few surprised opponents in quick succession. Paintballing tips will vary depending on the game type. Some will require your team rushing blindly into a situation all guns blazing. This is all well and good, but for the longer scenarios you’ll require the skill of stealth. Try to blend into your surroundings and pick off opponents one at a time rather than racing straight into a danger zone and fighting your way out. 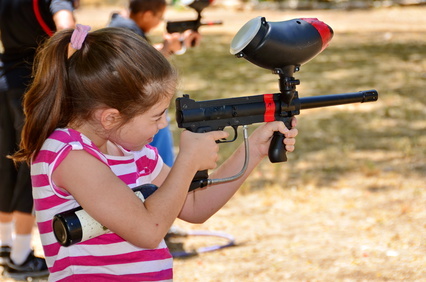 When in the paintball arena you’ll want to use all sorts of tactics to take down your opponents, using stealth and diversionary tactics to gain an advantage over your competition. Whilst there will always be those wandering off as lone wolves, you’ve a much better chance of success by sticking together and following a structured plan. You should have a quick discussion with your team before the round starts on the best way to approach each game type and split into small teams to spread out across the field. 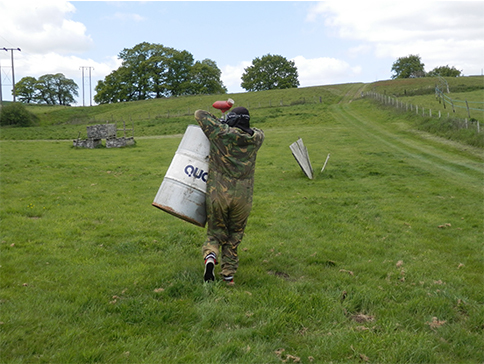 One of the best paintballing tips is to make the most of your team and coordinate with them for executing offensive manoeuvres. If you spot an enemy hiding 50 feet away, shout to your team and rain down bullets on their position. Paintball is a team game and should be treated as such. To be as competitive as possible it’s important to work closely with your team, rather than running off to try and win the game solo. Whilst you may get a couple of opponents out the game, you’ll soon become isolated and eliminated – Then you’re no use to anyone. There’s the chance you’ll pursue one route before having to double back as the enemy’s defensive positions are too strong ahead. Don’t get caught out, by thinking of another strategy and way to approach the game. How can you counter your opponent’s strong position? Find an alternative route and breakdown your opponent’s positions one stronghold at a time. 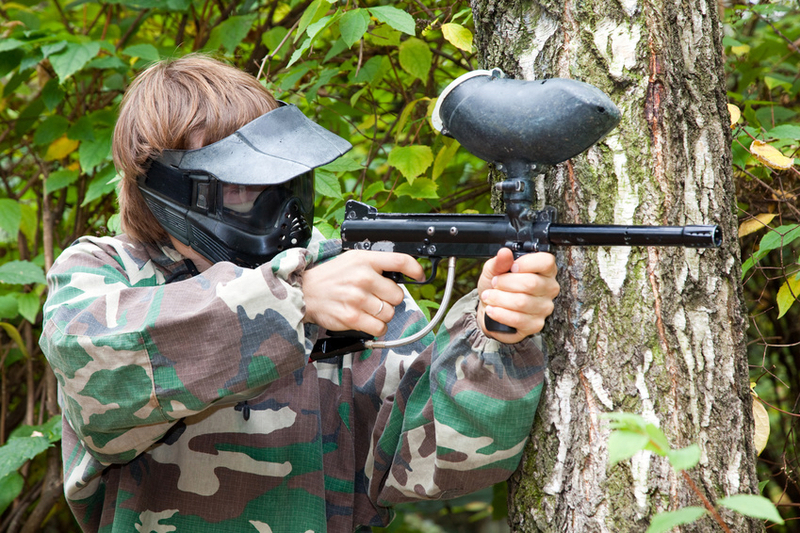 In paintball there’s the strong possibility you’ll need to dive into cover at any time as your opponents manage to flank and outmanoeuvre your team. If you’re out in the open you’re a walking target – By sticking close to cover and moving slowly you’ll be able to react and get into a hiding space before getting hit (unless your enemy has a well-placed shot). You can also use your enemy’s shots to determine their positions. Pop out every now and then to draw fire, so your team can shoot at their positions and take out the opponents. At the end of the day, you’ve paid to play and enjoy the day. You will get shot and you will be eliminated from some game types. Just enjoy the experience and try not to get irate – Even if a teammate accidently shoots you in the back!